Tuesday happened to be my birthday, and in my case, I don’t just want a birth day, I want a birth month. So for the whole of July I used my upcoming birthday as my excuse to basically try and get my own way and to justify my terrible spending habits. Not that I ever need an excuse, but hey it’s nice to actually have one. My birthday ultimately means more shopping, more clothes, and yes, more shoes. Shoes, shoes, shoes and more shoes; my name is Katie and I am a total shoe addict. In the past month or so I seem to have gone a little crazy and got a ridiculous amount of new ones. And for various reasons; some have been birthday presents from loved ones, some have been birthday treats to myself, some really affordable and gorgeous, and others amazing sale finds I would have been stupid to pass up. So, with that in mind, rather than show some of them in various outfit posts, I thought it may be a good idea to do a whole post dedicated to all of the new additions to my shoedrobe. Fair warning, the majority are actually boots as they are most definitely my weakness, but each and every pair has brought me so much happiness and I want to share them with you. First up are my absolute favourites and a pair I have been wanting for a very long time. These rose gold beauties are from Office, one of my favourite shoe stores. I had wanted them in silver for months and had been planning on asking my boyfriend for them for my birthday. That was until they brought them out in rose gold and I died a little, I can’t get enough of it, and so to actually have a pair of rose gold boots is like a dream come true. I loved my rose gold ones so much I had to get them in black too. They’re such a classic boot but with a nice little twist thanks to that gorgeous wooden look heel. I knew the black would be a smart choice as they’re so versatile and I know I can wear them with pretty much anything, anywhere, anytime. I’m basically just obsessed with these boots and want them in every single colour. These shoes were love at first sight. I’ve been paying more and more attention to Next lately, and I spotted these slingback heels in store a few weeks ago. I immediately fell in love with that amazing chunky tan buckle detail and how it contrasts with the black patent. They have a flared heel too which is gorgeous. I feel like they have a kind of sixties vibe to them as well which makes them even dreamier. And if all that weren’t enough, they’re shockingly comfortable. Every Autumn/Winter I have a thing for over the knee boots, but at the moment I only have flat pairs and no heels. With the new season fast approaching I decided to add these bad boys to my collection after seeing them in the sale on Asos. Classic black suede style, good heel height, nice length up the leg, and they actually stay up and don’t fall down all the time, which is surely one of the most annoying things about thigh high boots. They’re the perfect addition. Would you look at that incredible magenta colour! How could I resist? 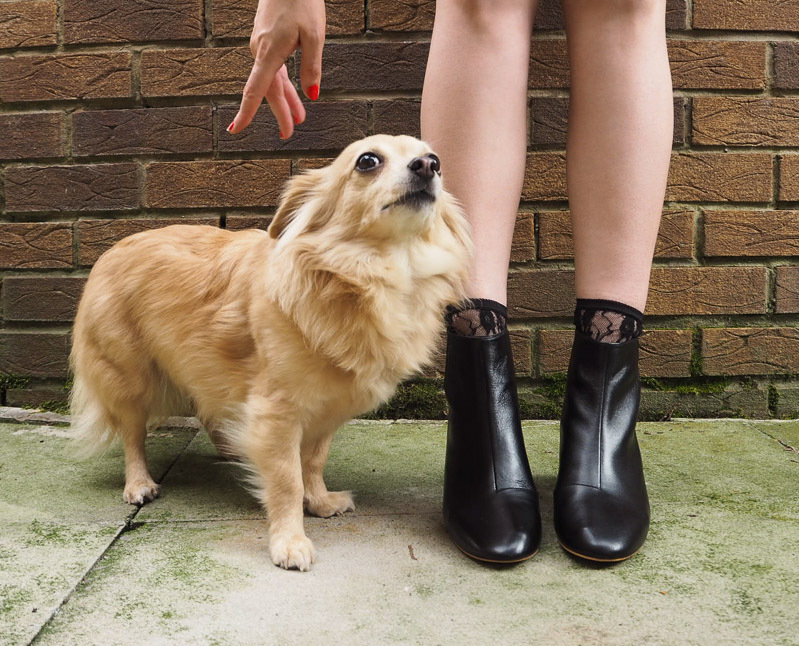 These Topshop boots really are dream boots. Not only am I in love with the beautiful colour, which already makes a major statement on its own, but then they have the most amazing abstract shaped heel. I just think they’re so cool. People keep asking what they’re like to walk in because of the oddly shaped heel but they’re really comfortable, you’d never know it wasn’t just a normal block heel. They cost more than I would usually pay for boots, but I love them and couldn’t bear the thought of leaving the store without them, so I decided to treat myself for my birthday. I’ve shown you these before in my last outfit post, but I wanted to include them again with a closer look as I think they were a really great find. They’re the ultimate classic black shoe for me. 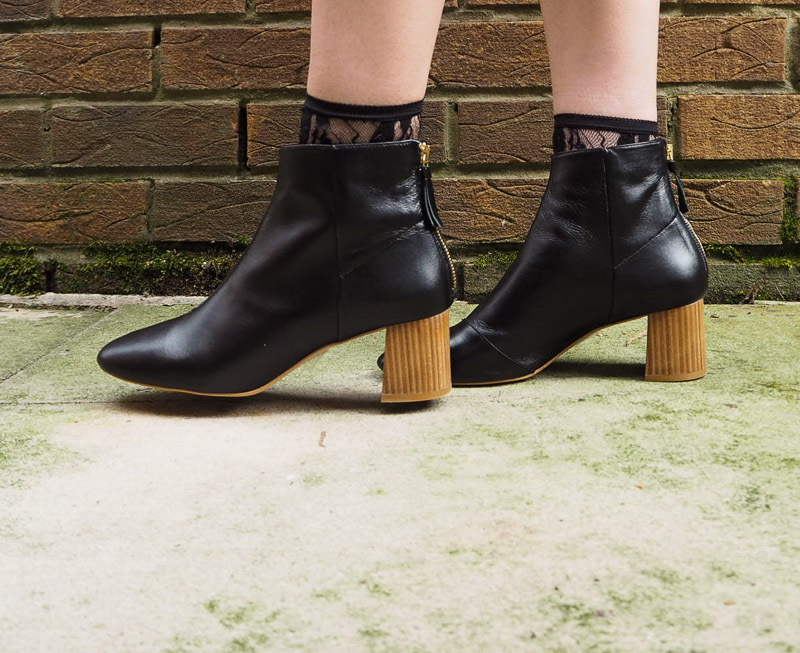 They’re exactly my style with the pointed court shape, they have an ankle strap fastening which I always favour, a nice inverted block heel which is a great height to wear every day, plus being black they go with everything. And only £12, what more could a girl ask for? These khaki ghillie shoes were another lovely find from a recent trip to Primark’s shoe department. Also available in black and tan, but I felt like the khaki were a little bit different as I don’t own any other khaki shoes at all, and I’m a big fan of ghillie shoes. I’m also kinda loving them paired with some glittery silver socks. I thought it was a slightly odd combo when I first put them on but I really like it, and it’s a great way to add that something extra to an outfit. I actually got these boots with some Asos reward vouchers I had saved up (seriously, Asos doing loyalty points has to be one of the best things that’s ever happened). 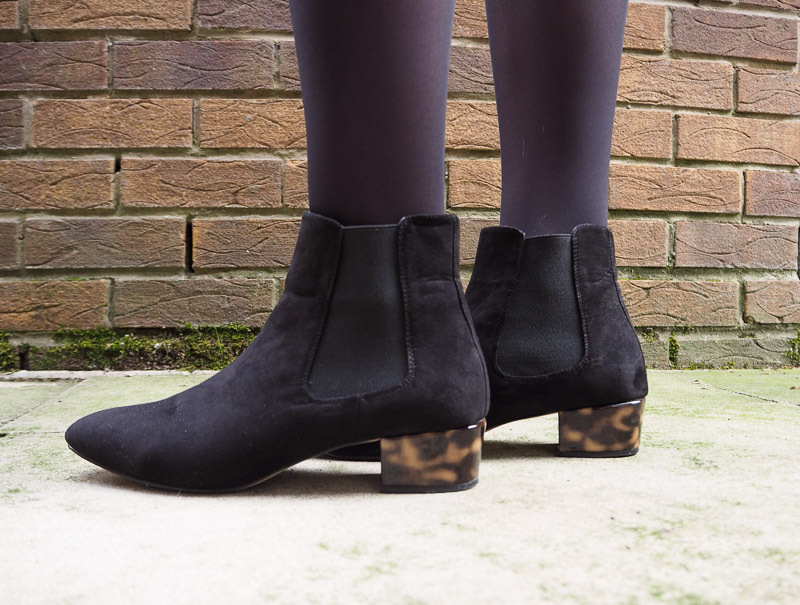 I have a real thing for tortoise heels and these low heeled Chelsea boots were perfect for me and are super cute. And I can’t get over how comfortable they are as well. I highly recommend them if you’ve been contemplating buying. There may not be many people who agree with me, but I happen to love navy and black together. It’s one of my favourite colour combinations. I had wanted these gorgeous navy patchwork boots from Warehouse for months but I couldn’t justify the £85 price. So imagine my happiness when they went on sale for just £34! I absolutely love the patchwork design on them in suede, leather and patent and I can’t wait to wear them through AW with black tights and big coats. So there we have it, all 9 new additions to my shoe collection. Now I am completely aware that this is more shoes than some buy in a whole year never mind a month, but shoes make me very happy. These are all going to get lots and lots of love and wear through the next season and beyond, and like I said it’s my birthday month so it's allowed. I am so in love with them all and I am one very happy birthday girl. A very happy birthday to you my dear blogging bestie! Well can I just start off with sayin you deserve them and they're all so gorgeous! I'm loving the sandals from next and primark and my fave boots have to be them patchwork ones alongside the rose gold ones! Absolutely gorgeous. They all suit you so well and I'd love to see how you styled them all with diff outfits I'm sure that'll be over the years with how many you have, they will last so long too. Beautiful photography by the way and a lovely read as always! The rose gold boots are so perfect - I've also found so many gems in Office lately! Happy Belated Birthday, Katie. Your new shoes are a absolutely AMAZING. I have a slight obsession with metallic shoes and those rose gold boots are stunning. I also love the magenta boots as they would add a great pop of colour to any outfit. such a lucky girl! i totally get it!! love them all but the toyshop ones are show stopping! Seriously loving all of these, especially the pink and gold boots. Dreamy! OMG! Those Topshop Megenta and Patchwork Warehouse boots are literally to die for. I love footwear fashion, they have really change any look for the better. I am a huge shoe addict too and you have a beautiful collection!! My birthday is coming up too so I may be putting a few on the wish list! You've got a great lineup of booties! My faves are the rose gold and patchwork pairs. SO cute! I literally love all these shows they are so cute. I really need to buy some more shoes asap! Ah! They look so lovely, and your pup is just too adorable!